We are spreading kindness this month through our 100 Acts of Kindness project. We are challenging our readers to perform 100 acts of kindness between Jan 16th and Feb 14th. You can read more about our kindness challenge here. Many of our blogging friends have joined the challenge and will be sharing ways that you can spread kindness here and on their blogs. Today we are so lucky to have Allie from No Time for Flashcards as our guest blogger. Allie is a successful kid blogger and a great mom. I loved reading about these simple ways that she teaches kindness in her home every day. Welcome Allie! Teaching children about kindness is never ending, and in a world that revolves around instant everything long haul lessons like how to show kindness can seem daunting. Kids learn by example and there is sign at our coop preschool that says " There is no time when a child is not learning." It reminds me how everything we do is a lesson to them whether we have a lesson plan for it or not. Leading by example is the never ending part. Screaming " Get to your room!" is not the example I want to show to my kids but I have and know I am not alone. Incorporating intentional activities and opportunities for your children to show kindness to others in their everyday makes this so much more manageable. Like setting them up for success with a challenging lesson by giving a few easy to complete tasks to start with, giving your kids ample opportunity to make the choice to be kind is setting the stage for more kindness. Helping each other with small tasks like putting on shoes. 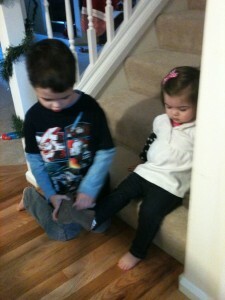 I won't ask them to help each other, instead I will say " If you need help with your shoes sit on the step." It's often greeted with siblings helping each other. There is no punishment for not helping just recognition that helping was kind. 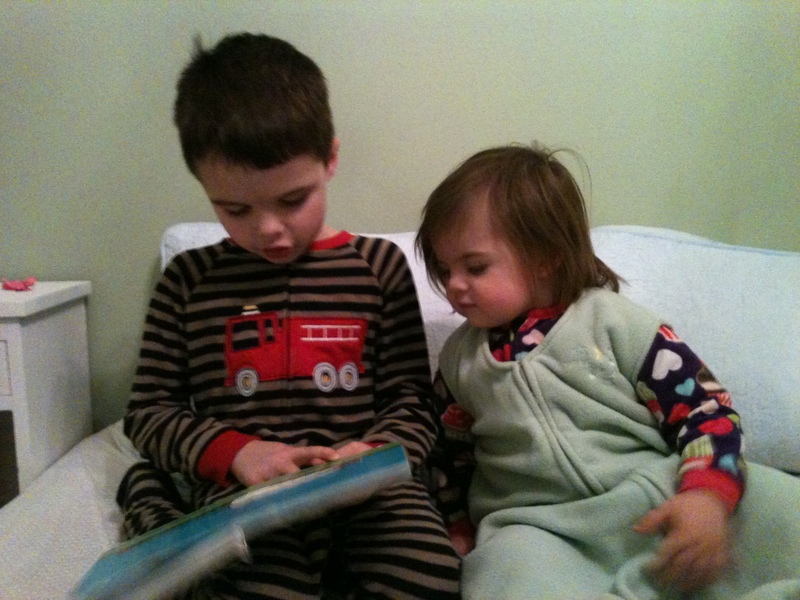 A favorite "job" in our house right now is my son reading my daughter a bedtime story. Of course we are also thrilled he is reading and loving it but the nightly story has spun off into a way for him to really help us when we are in a bind. When we need her to sit for a minute or two ( like when we are cleaning a toilet or getting dinner in the oven) we ask him to read to her since she will always sit for a book. He feels proud for a job well done and he's also praised for being kind not only to us but to his little sister. We encourage each other a lot. My husband and I thank each other for cleaning, cooking and thank our kids for any help asked for or not. We expect them to say please and thank you not just to us or other adults but to each other as well. Now don't get me wrong we aren't the Cleavers. We also use less than encouraging words when we are frustrated and I did once throw duplo at the wall when the sectarian violence over a red duplo in our playroom pushed me over the edge. My outburst did nothing positive but I'm human and the apology that quickly followed hopefully showed my kids that when you are wrong it's kind to apologize. Manners aren't just old fashioned they are a way of being kind to everyone with our words. My son helps me read the board at grocery to see what the food bank needs. Then we decide what to add to our list to drop off on our way out. It's an important lesson and often only adds a dollar or two to our bill. What a deal! This fall when a local charity came door to door I declined giving and my son was perplexed. He ran upstairs to his piggy bank and I followed asking him what he was doing. He wanted to give the horse rescue his money he said. I went to my purse and grabbed a five dollar bill, he chased the guy with the horse (yes they brought the horse door to door) and handed it to him. I praised him a lot for that. I am not sure that if he didn't see us giving to charity often that he'd have been so adamant about giving himself. The last every day way we try to teach kindness to our kids is to listen to each other. To put lap tops away, put phones down and just sit and say "I am listening." Being kind means being considerate and slowing down to hear our kids so they will slow down to hear us. This is the hardest one for me but my son has been giving me lots of thumbs up lately so hopefully I am on the right track. It's all work in progress right? What every day acts of kindness do you encourage in your kids? Thanks Allie for sharing these simple and fabulous ideas! I may or may not have yelled a bit too much yesterday. :( So glad today I started with a clean slate! I love the pics of your guys reading together. I need to encourage my son to read to his little sister more. What sweet siblings yours are! If you want to read more by Allie, head over to her blog No Time for Flashcards or her No Time for Flashcards Facebook page. Both are such great resources for parents and teachers. There is no way possible for me to pick a favorite post from her blog, but I do love all of Allie's Pretend Play posts- especially this grocery store one. Stayed tuned for a guest post by Sun Hats and Wellie Boots tomorrow! You are so right! It really is the everday oppportunity to teach our children about kindess that makes an impact. Lovely post, Allison! It's all about starting with kindness at home in small ways. We model to our children how to treat others. The picture with your son reading to your daughter is so sweet. Such lovely ideas - and proof that kindness is often taught through small and simple gestures! Thank you - I was a little worried about looking like mommy dearest admitting to the duplo tossing !